In the management of end-stage renal disease, compared with dialysis, transplantation has significant improvement in overall survival. Damage to cortical microcirculation, an early event in the course of acute rejection crisis precedes measurable functional derangements in the transplanted kidney. Assessment of perfusion pattern by radionuclide renography may serve as a reliable index in diagnosis of acute rejection crisis  and can differentiate acute rejection crisis from acute tubular necrosis. 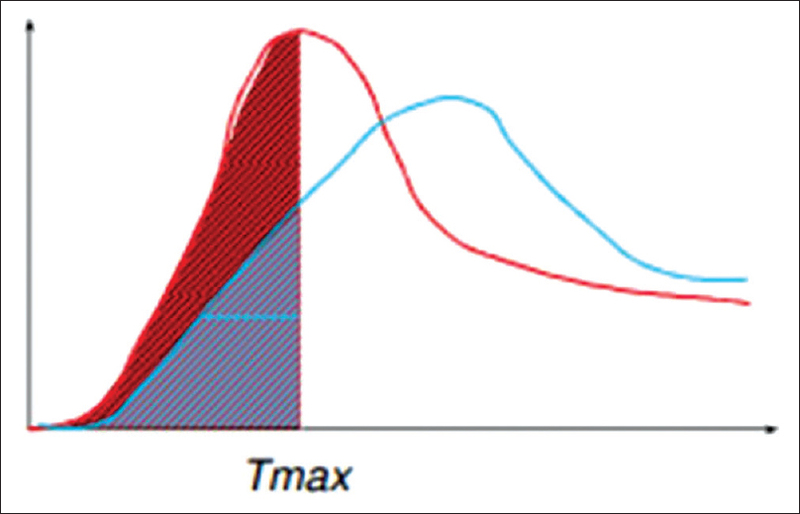 Hilson's perfusion index is calculated as the ratio of the area under the arterial curve to peak divided by the area under the renal curve to peak multiplied by 100 [Figure 1]. A renal transplant recipient presented with delayed graft function 36-h posttransplantation. Transplant kidney was harvested from a cadaver donor. Cold ischemia time and warm ischemia time were 1 h and 15 min, respectively. Nondepleting type of induction with basiliximab 20 mg on day 0 and day 4 was used. Later, triple immunosuppression with prednisolone, tacrolimus, and mycophenolate was used. The patient was examined with 99m technetium (Tc) diethylenetriaminepentaacetic acid (DTPA) renogram. Patient preparation and data acquisition are performed as per the standard guidelines. Gamma camera detector is positioned over the kidney in the right iliac fossa. It is seen that the lower abdominal aorta and the external iliac artery are in the field of view. An intravenous bolus injection of 5.5 millicurie of 99m Tc-DTPA is administered through a large vein. A large field of view gamma camera with low-energy high-resolution collimator is used. The images are acquired at the rate of 2 s/frame for the first 60 s, and then, 15 s/frame for the next 30 min in 127 × 127 matrix. The high frame rate and rapid dynamic renal examination during the 1st min is for perfusion evaluation, and serial images of longer duration during the subsequent part of the dynamic study are for the evaluation of extraction and drainage patterns. Time-activity curves are obtained for 1st min images to evaluate the perfusion of graft and external iliac arteries by drawing region of interests both around graft kidney predominantly cortex and iliac artery [Figure 2]. Pre- and post-injection syringe counts are determined, and injection site imaging is conducted for accurate quantification of renal function. Postvoid static images are obtained to identify the complications such as peritransplant fluid collections, obstruction, and reflux. Normal perfusion index is considered as below 150. Hilson's perfusion index was 76.5, in this patient [Figure 3], suggestive of maintained perfusion thus ruling out rejection, and features were more in favor of acute tubular necrosis which was further confirmed on allograft renal biopsy done 58 days after transplantation. Biopsy was suggestive of allograft rejection due to ischemic necrosis due to the rupture of aneurismal artery. Immunofluorescence was suggestive of IgG1+ granular, IgA negative, IgM1+ segmental, C3 negative, C1q negative, kappa, and lambda negative. The choice of treatment for the end-stage renal disease is renal transplantation. 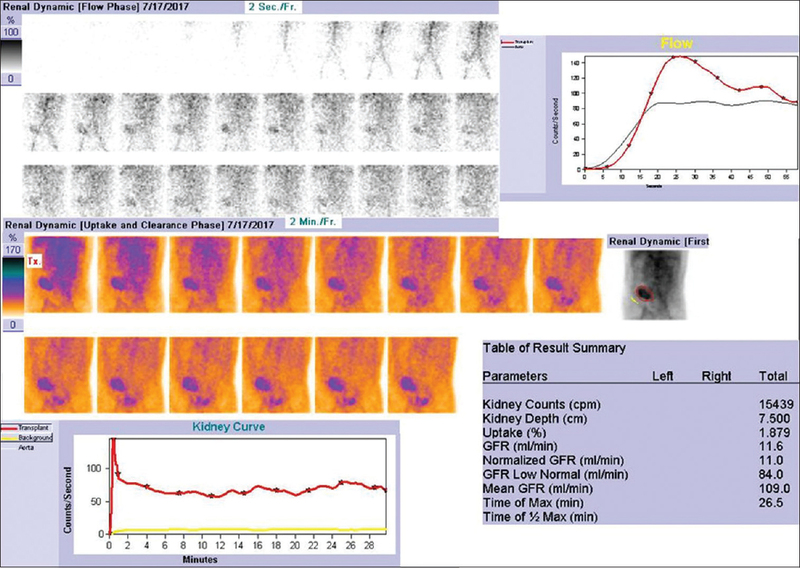 Dynamic renal scintigraphy has its own unique role in the demonstration of renal function. To differentiate acute tubular necrosis from rejection, the “Hippuran Excretion Index” using (I 131) Hippuran is used by many groups. The disadvantage of this method is the long half-life of the compound; hence, it is difficult to perform serial studies at frequent intervals,99m Tc-labeled compounds have an advantage of short half-life, and the study can be repeated at frequent intervals. A good bolus injection, and following standard procedure guidelines together with the use of cortical region of interest, small changes in renal blood flow can be assessed, and standard error can be limited to 5%. Normal perfusion index has a value below 150 and it increases with falling perfusion such as in rejection and renal artery stenosis. Hilson's perfusion index is used to differentiate between normal grafts and those with rejection. In normal renal transplants, the graft is well seen on the vascular image. The region of interest curves shows that the renal curve is almost superimposed on arterial curve in the vascular phase and the perfusion index in these cases has always been below 150. In acute tubular necrosis, the transplant is usually well-perfused, and this is reflected in curves and in perfusion index. Acute tubular necrosis is due to the necrosis of tubular cells and the senescent cells fall into the tubular lumen causing obstruction to excretion, leading to decreased urine output. Acute tubular necrosis is more common in cadaver transplant recipients than recipients from live donors. In rejecting graft, there is an impairment of perfusion visible in the vascular image. 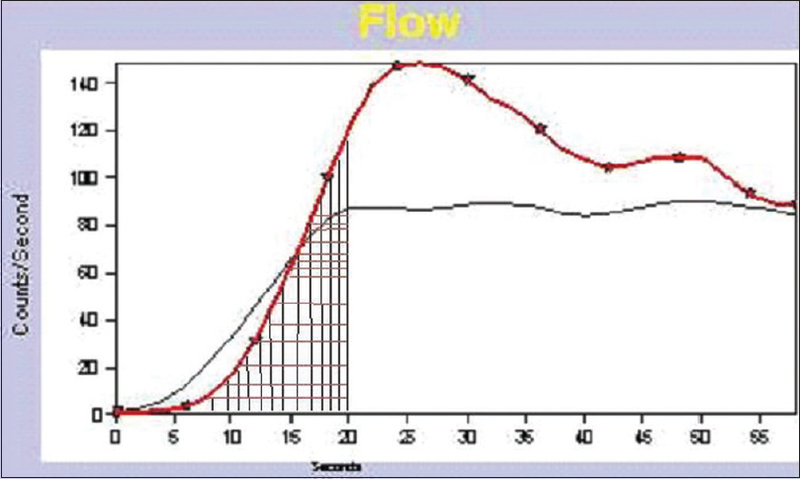 The impairment of perfusion is demonstrated by the increase in perfusion index. Rejection is accompanied by rise in perfusion index and in the presence of successful therapy, there is a fall in the index, but when the therapy fails, perfusion index continues to rise. Hilson's perfusion index can be falsely positive if there is coexisting renal artery stenosis. It is less accurate if graft kidney global region of interest is taken into consideration. Taking cortical region of interest for evaluation than the global region of interest. Hilson's perfusion index with slight modifications of taking cortical region of interests into consideration and ruling out renal artery stenosis prior interpretation can noninvasively rule out rejection and aid in the diagnosis of delayed graft function. Anaise D, Oster ZH, Atkins HL, Arnold AN, Weis S, Waltzer WC, et al. Cortex perfusion index: A sensitive detector of acute rejection crisis in transplanted kidneys. J Nucl Med 1986;27:1697-701. Aktaş A. Transplanted kidney function evaluation. Semin Nucl Med 2014;44:129-45. Dubovsky EV, Logic JR, Diethelm AG, Balch CM, Tauxe WN. Comprehensive evaluation of renal function in the transplanted kidney. J Nucl Med 1975;16:1115-20. Hilson AJ, Maisey MN, Brown CB, Ogg CS, Bewick MS. Dynamic renal transplant imaging with tc-99m DTPA (Sn) supplemented by a transplant perfusion index in the management of renal transplants. J Nucl Med 1978;19:994-1000.